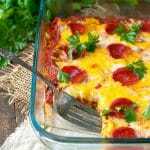 A low carb, healthy and delicious zucchini pizza casserole. 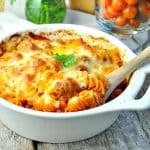 All made in one dish with minimal effort it's a great way to serve a comforting dinner on busy weeknights! Your kids love pizza, you’re trying to avoid gluten or carbs, and your husband just wants to eat meat. Oh, and you have no time to cook! Instead of calling for carry-out, prepare one easy Dump-and-Bake Zucchini Pizza Casserole that will keep your entire family happy! Any busy parent knows how hard it can be to come up with new or different dinners that are healthy, that are fast, and that actually appeal to everyone around the table. You guys, I feel like I’m on a never-ending quest to get my boys to eat their veggies (husband included)! So when I saw a recipe on Taste of Home for zucchini pizza casserole, it obviously caught my attention. What better way to get the kids to eat some greens than by combining the veggies with their #1 favorite food — pizza?! 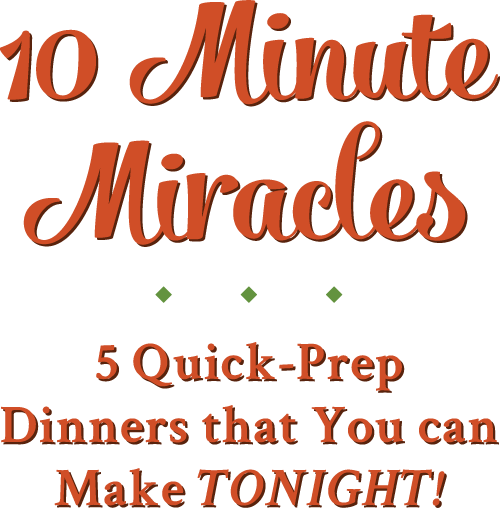 I tweaked the original recipe to suit my busy schedule and to make it even faster. Dump-and-bake is the way to go, right!? We love our spiralizer for making zucchini noodles, but if you don’t own a spiralizer or if you really want this to be dump-and-go with no prep, then you can usually purchase zucchini noodles (“zoodles”) in the produce or deli section at a grocery store. 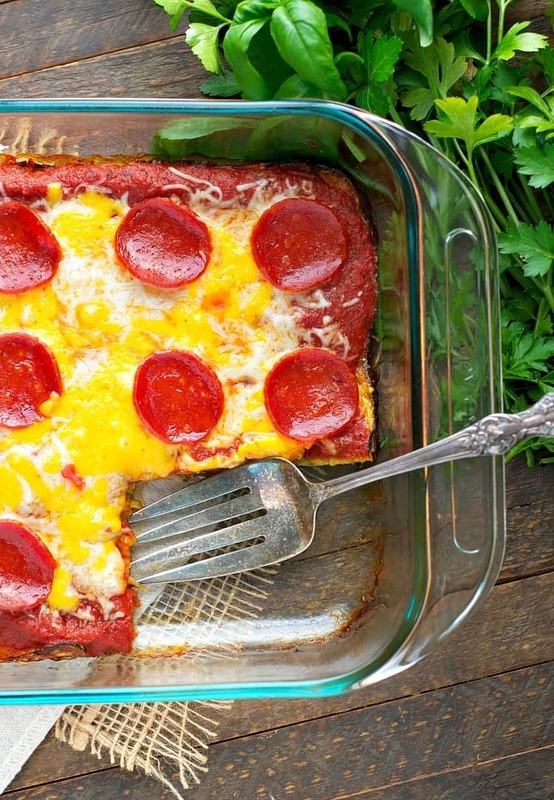 That’s a shortcut that will make this pizza casserole even faster (and who doesn’t want that?)! The cool thing about this dish is that it tastes just like pizza, but there’s no bread/dough/flour involved. Instead, you create a crust with the zucchini, egg, and cheese…and it’s seriously GOOD. My boys were a bit skeptical when I originally introduced them to this concept. No surprise there, right? Tell 3-, 5-, and 7-year-olds that they’re eating a zucchini-crusted pizza casserole and eyes start to roll. But, when they smelled the pizza casserole baking in the oven, and then when they saw it on their plates, they were completely sold! The boys all gave this dinner two thumbs up and a stamp of approval. And according to Gibbs, “you don’t even taste the zucchini!” And that’s actually true. 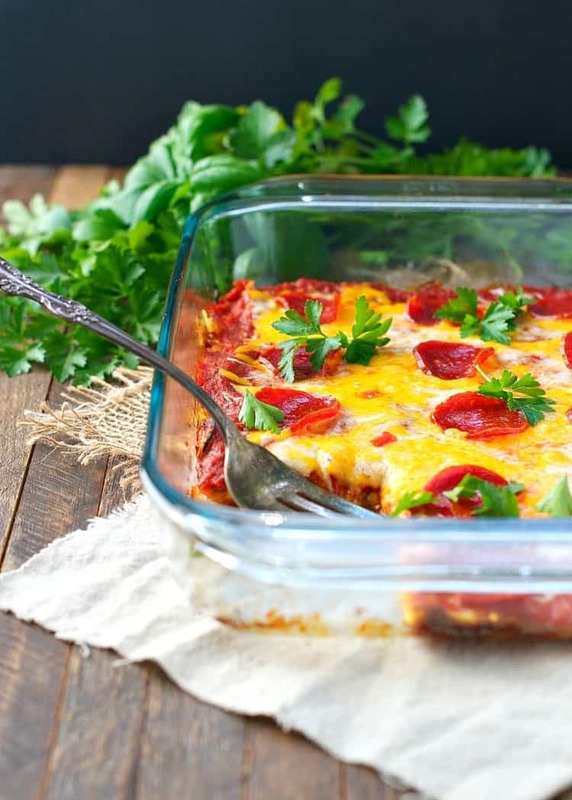 This is one more dump-and-bake dinner to add to your weeknight repertoire that will keep each of your finicky eaters happy and healthy this year! Enjoy! Cooking for Two? You can easily cut this recipe in half and prepare it in an 8-inch square baking dish. 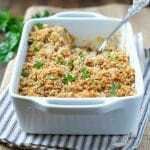 You might also like to make a full recipe, but divide the ingredients between two 8-inch square baking dishes, freezing one of the dishes for a later use. For freezing instructions, see below. Want to Prep Ahead or Freeze this Meal? You can prepare the zucchini crust early in the day and then just top the crust and bake it for dinner later on. Alternatively, if you would like to freeze the meal, you can bake the dish in the oven as directed, allow it to cool completely, and then cover tightly. Place in the freezer until ready to serve. To thaw the frozen dish, allow the casserole to partially thaw in the refrigerator overnight. Thirty minutes before baking, remove the casserole from the refrigerator and allow it to come to room temp. Uncover and bake at 350 degrees F until heated through. No Spiralizer? 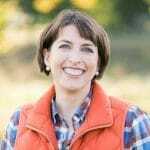 – If you don’t have a spiralizer, or if you want a shortcut, you can purchase zucchini noodles in the produce section at a lot of grocery stores. Alternatively, you can use about 4 cups of grated zucchini. Preheat oven to 400F (200C). Spray a 13x9-inch baking dish with cooking spray and set aside. 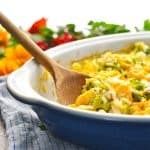 In the prepared dish, combine zucchini, eggs, Parmesan cheese, 1 cup of mozzarella cheese, and ½ cup of cheddar cheese. I like to use my hands to make sure that it’s all completely combined, and then press the mixture into the baking dish like a crust. Top cooked zucchini with pizza sauce, pepperoni, and remaining cheese. Bake for another 15 minutes, or until heated through and cheese is melted. *If you don’t have a spiralizer, or if you want a shortcut, you can purchase zucchini noodles in the produce section at a lot of grocery stores. Alternatively, you can use about 4 cups of grated zucchini. *If you don’t have a spiralizer, or if you want a shortcut, you can purchase zucchini noodles in the produce section at a lot of grocery stores. Alternatively, you can use about 4 cups of grated zucchini.Recipe adapted from Taste of Home. OMG this looks so good! I love that zucchini can substitute so easily for most breads and grains. I’ve never made a dish like this with zucchini before…I’m intrigued! Especially since pizza is my favorite food. Love that this is on the healthier side and loaded with flavor. My husband would love this, too! Thanks, Gayle! Yep — it appeals to ALL! Have a great weekend! This is genius! As much as I love zoodles, my love for pizza will ALWAYS be greater! 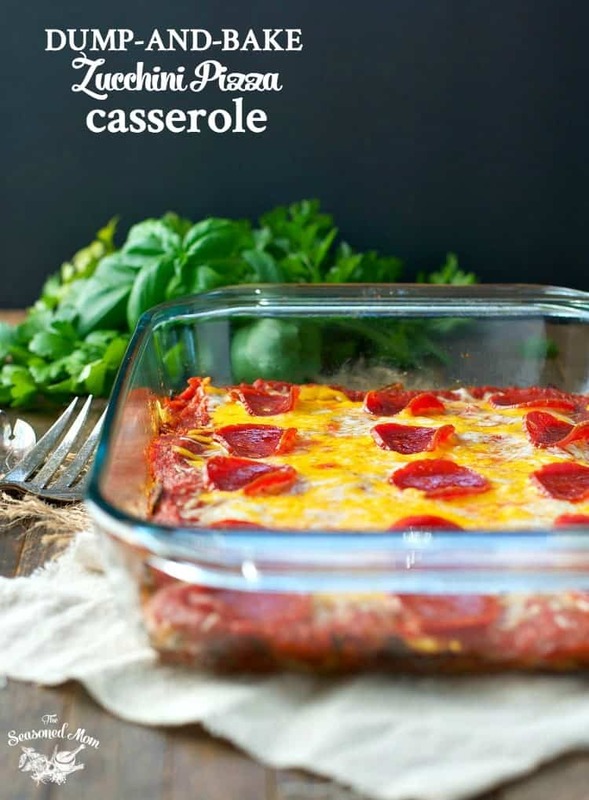 So great that you combined the two for this tasty crowd-pleasing casserole! 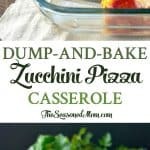 Anything with “dump and bake” in the title is right up my alley. 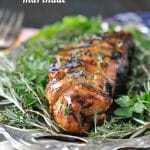 This looks delicious and so darn simple! I have a feeling this one might be a new weeknight staple! You and me both, Karly! Dump and bake is the way to go! Yum! This looks amazing – and Jesse has just started loving zucchini so this came at the perfect time! Awesome! Hope you’ll give it a try, Kristy! I am so excited to try this out. I love eating zucchini and I like it even better when I can trick my kids into eating it. Unfortunately, none of them are fans of zucchini – raw or cooked. Another trick is to shred, then freeze the zucchini when it’s in season. Then when you thaw it, the water naturally separates and can be drained right off. Thanks for another great recipe! Hi, Treasure! I love the idea of freezing zucchini to use in the off-season. Thank you! And I’m so glad that you might give this a try. Hopefully it passes the kids’ approval! I made this last weekend and I will tell you it was AMAZING!!! I am a family of one so I cut it into single servings and froze a few of them. I did add a diced onion which I sauteed for a few minutes while the zucchini was draining. I ate this for the whole week and literally could not wait for lunch each day! It heats back up very nicely. I will definitely be making this again. Thank you for the great recipe! Yay! I’m so glad that you loved it, Courtney! I agree — it reheats so well! OMG… this was absolutely delicious! My husband and I both loved it! I made it exactly like the recipe! Next time I will add some mushrooms on the top and put onions in the crust just for a different variation! Thank you so much for the recipe and a great way to use up my frozen shredded zucchini? WOW! I made this tonight and my husband said, several times, “This is a keeper. Don’t forget about this one. It’s amazing!” He had no idea the crust was zucchini. When I told him, he couldn’t believe it. I use zucchini noodles in quite a few dishes, usually with a little pasta, and he likes it but he LOVED this dish!!! I did too! Thank you! Do you think you could turn this into a bbq chicken pizza by changing the meat, sauce and adding so Gouda and cilantro?